GUYS: YOU SHOULD READ THIS TOO. Sorry for the caps but I want to emphasize that while these posts are targeting women, some of this stuff will appeal to you guys too! For your convenience, look for the paragraphs that have a mint colored word in them. When I think of summer, I think of the Texas heat. I've been living in glorious Cali weather coming up on two years now, but I can't help but think of the sweltering summers I endured back in the homeland. Funny part? I actually miss it! I love not having to wear a jacket of any sort when I go home March through October. Here, I've gotten a pretty massive sweater collection going for those chilly mornings and cool nights. The point is this: when it's hot, muggy and miserable outside, or even when it's not, how refreshing is it when you get a whiff of something that smells or tastes like peppermint? Don't kid yourselves, we all chew peppermint gum to refresh our breath and if you've ever had a pedicure, how orgasmic (I hate that word but it gets the point across) is it when they use a peppermint scrub or lotion on your legs and feet? This is all spawned because, for whatever reason, I felt inclined to purchase this conditioner by Organix. Nevermind that I have six conditioners sitting in my makeup drawer just waiting to be used. I MUST buy another to try! And am I glad I did. The Tea Tree oil softens and strengthens the hair, while the peppermint leaves a tingle and smells divine. Guys, I know you might feel weird, but have your mom or girlfriend (or whoever) go to CVS (or any drugstore) and buy this for you! Or grow a pair and buy it yourselves. They also have a shampoo if you don't use conditioner. I think some of you dudes are terrified of acting in any way feminine, when the fact of the matter is that you would enjoy some of the products I suggest, especially this one. It leaves you feeling revitalized after a hard workout or will help to wake you up in the morning -- why do you think they tell you to smell or eat a peppermint if you have a big test or presentation coming up? It helps you to focus! So this got me thinking about the other glorious products I love that have mint in them, and it turns out I might have an addictive personality when it comes to the flavor. A bunch of items I 'favorited' on ShopStyle were all in minty tones, so it compliments this post perfectly. I love it when that happens! ﻿Starting with beauty products (counter-clockwise): I can't remember when I first heard of Jurlique. Like all things I try out, I probably read in a magazine about how a celebrity liked it. I do remember buying it pre-college and the labeling being different. Not the point. But what I loved about this cleanser was that it was so refreshing and it actually worked. I was using it to keep my skin clear (check) and keep it hydrated (check). Use it in the morning before you go to work or to wake you up for a morning workout. Essie's Mint Candy Apple: a hue that's calming, bright and eye-catching all in one. No, it doesn't smell like mint, but how awesome would that be? When I wear it I get tons compliments. "Ohh girl, what color are your nails?!" I think they make a similar gel tone by Shellac that's called "Seafoam." Note: it's unavailable on Essie's site currently, but most nail salons and beauty supplies will have it. Rohto eye drops are no joke. Bloody hell. They don't burn, persay, but they do a pretty good job of removing impurities and eliminating red-eye (read: your eyes will water like nuts). It's a "hurts so good" type of thing. I swear by them, especially on flights or if I've had a rough night. They're extra lubricating and since my eyes apparently chap at night, these drops work wonders. I don't know how to describe it, but it "feels minty" in your eyeball. I know that sounds ridiculous but give them a try... you'll never go back to Visine! A contender for one of my favorite beauty brands, Philosophy, makes an awesome SPF for the lips that protects, soothes and smells good (vanilla mint). I know it's pricey ($16.00), but it lasts you awhile! Back to the pedicure/massage topic: when someone massages you with mint oil or lotion, it feels so refreshing, with the added bonus of a comforting smell. 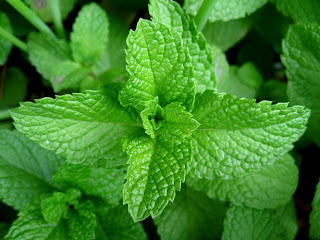 Don't you want to be around people when they smell like mint? I do. I wonder if that's the scent Justin Timberlake wears... but it all seriousness, when people smell like mint, it makes one feel like that person is clean. Has good hygeine. Prides themselves on their grooming. Really guys and gals, you can't go wrong if you emit some kind of peppermint-y smell. Clarins makes a lotion that relieves tired legs, tones them and hydrates. It includes not only mint but menthol, which is the great ingredient we all love in Vick's Vapor Rub. If you run or excercize your legs consistently, this is a great item to keep on hand. Juicy Couture Hippy Wrap Glass Bead Headband: Envision Nicole Richie wearing this to a soiree or pool party, sipping a mojito and sporting some oversized shades. Tres summer chic, yeah? You could also wrap the band around your wrist or let it fall on your neck for a unique bracelet or necklace look. THE SHOES! How adorable are both of these? The espadrilles are sold out (and non-minty), but would pair nicely with the suit. The main focus here are the brightly colored wedges!!! I love how tall they are and the color pallette is pretty and feminine. Sadly, they sold out as I am writing this. NOOOO! If anyone can give me a lead on where else to find these babies, letcha girl know. Now that you've gotten all of these minty-fresh recommendations, go grab a mojito and get ready for a fabulous summer season! Adam's mom gave us mint extract and told us to smell it to wake us up! It totally works!